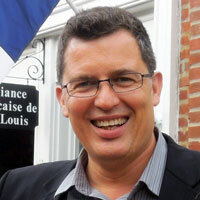 Lionel Cuillé published an essay on French novelist Emile Zola in the European journal RELIEF. ... Zlatko Cosic's exhibition, STORY 4: SCENES 1-9, has been selected for the Intimate Lens Ethnographic Film Festival, Caserta, Italy. ... Ashley Johnson was a panelist at two entrepreneurial-focused events this winter in St. Louis and Dallas. Karla Armbruster will present at Rhodes and Stellenbosch universities in South Africa, Joe Roberts received the Visionary Leader Award, Zlatko Cosic's film will screen in the U.K., and Travis Mossotti presented at TEDx Gateway Arch. 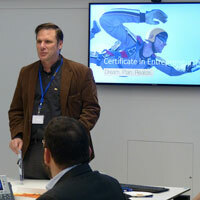 The Business and Management department at Webster Vienna held an info session on the Undergraduate Certificate in Entrepreneurship, informing students, faculty and staff about new practice-oriented elements that have been added to the program. Program coordinator and assistant professor Nada Mumdziev also introduced the Webster Entrepreneurship Ecosystem and its student support features.